Manuel Herrera, a student at Whittier College, says his state-funded Cal Grant helps make it possible to attend a small private school. Manuel Herrera relies on an array of federal, state and campus aid to help pay his tuition at Whittier College, a private liberal arts campus where he is a pre-med freshman. Among his most important scholarships is a $9,084 per-year Cal Grant, a state-funded subsidy for low- to middle-income students. Without that Cal Grant, Herrera said, he would find it difficult to cover his costs even though he saves money by living with family and commuting to school. With the grant, he said, he was able to turn down admission offers from public California State University and University of California campuses in favor of the smaller, more intimate college he sought. However, future private college students may not get the same level of help. A possible reduction in the size of the Cal Grants that can be used at independent campuses may be in the works even as Cal Grants for CSU and UC students are expected to rise. That cut would not affect students like Herrera who are already enrolled and can keep their current grant levels through graduation. However incoming students this fall and after may have it tougher at Whittier and about 90 other private colleges and universities in California. Following a much-debated and delayed legislative plan, Gov. Jerry Brown’s recent budget for 2017-18 calls for a $1,028, or 11 percent, drop in the maximum size of those Cal Grants starting in the fall for new students at private campuses. That proposal is at the center of a political and financial debate in California about how much taxpayer-funded financial aid should be used at independent colleges and universities. The discussion also puts a spotlight on a fact that may not be widely known outside of financial aid circles: most states have similar programs aiding students at private schools. About 28,000 California students now receive those grants and use them at colleges across the state ranging in size from mega-universities such as the University of Southern California in downtown Los Angeles to small ones like Whittier, a 1,700-student school in eastern Los Angeles County that was founded by Quakers and named after the poet John Greenleaf Whittier. In reaction to the recession’s devastating impact on the state budget, a series of reductions to these Cal Grants for independent schools were approved by the Legislature five years ago. In 2012, the maximum dropped from $9,708 to $9,223, and the following year went down to $9,084. But since then the Legislature has postponed another scheduled reduction. Now, Brown seeks to return to the plan and go down another 11 percent, to $8,056, for the upcoming fall. Brown’s position on those Cal Grants is part of cautionary belt-tightening “in the face of a projected deficit, and maintaining spending on key priorities,” according to a statement from H.D. Palmer, a spokesman for the state Department of Finance. The annual savings are expected to be about $7.4 million the first year, and should increase as students with the larger grants finish school, according to the California Student Aid Commission, which administers the program. In all, those Cal Grants for private schools are estimated to cost taxpayers about $240 million a year, the commission estimated. Not surprisingly, independent colleges are lobbying hard to avoid the cut. Among their efforts, students and faculty are going to Sacramento to plead the case with lawmakers. Officials of independent colleges say it makes economic sense to maintain the Cal Grants at the current level because it would cost taxpayers more in various subsidies and facilities expenses to enroll those students at a CSU or UC. In addition, encouraging students to attend private colleges eases overcrowding and admissions pressures at state schools, they add. And they contend it is an efficient investment since Cal Grant students at private colleges graduate in four years at relatively high rates, especially compared to CSU. The proposed cut would have “a chilling factor on the college enrolling low-income students. That’s something to worry about,” said Kristen F. Soares, president of the Association of Independent California Colleges and Universities, an organization that includes 65 colleges that enroll Cal Grant recipients. In what she described as “a partnership” with state and federal financial aid sources, her member colleges on average award about $18,000 in their own additional grants to students who receive the Cal Grants, Soares said. While some schools have large enough endowments to make up the difference if the Cal Grants are reduced, many colleges “cannot afford to backfill in for a thousand dollars. And for students to pay that would be a significant increase,” she said. Influential Latino legislators said they are supporting private colleges’ cause, citing that 40 percent of Cal Grant recipients at private colleges are Latino. The proposed cut “is a disservice to our hard-working high school students and their families – every student with a willingness to succeed should not be denied their dream college,” said a letter to Legislature leadership from Sen. Ben Hueso (D-Chula Vista), who is chairman of the California Latino Legislative Caucus, and Assemblywoman Lorena Gonzalez Fletcher (D-San Diego), who is its vice chair. At Whittier College, where tuition is listed at more than $45,000 a year, 467 students receive the Cal Grants and the campus often gives those students additional financial aid, according to Julie Aldama, the campus’ financial aid director. Since many admissions and award letters already have been sent to fall 2017 applicants, the college is using the current Cal Grant level, without the possible reduction, in financial aid packages, she said. If the cuts occur, students won’t have to make up the loss because the college will pay the $1,028 per-student difference from its own endowment or by reducing spending elsewhere, she said. With strong competition from UC and CSU, Cal Grant funding is very important since “it helps students attend a private institution as opposed to a state one,” Aldama said. 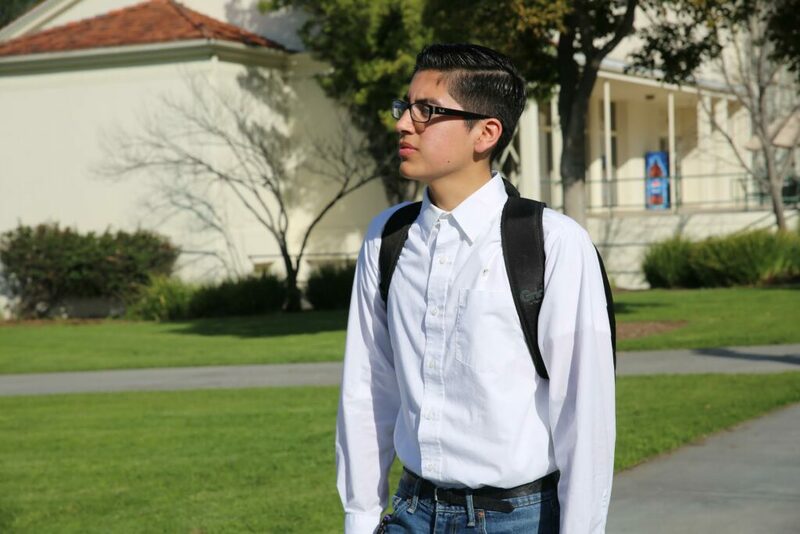 Herrera, the Whittier freshman, said his aid package includes a $25,000 grant from Whittier, a $5,815 federal Pell grant, and $7,900 in various federal loans – as well as the Cal Grant and some work-study funding. His family, he said, cannot afford to contribute. “I feel if you are given the opportunity to go a private college and they are giving you a scholarship, why wouldn’t you want the opportunity?” he said. Forty other states offer similar aid, according to the National Association of State Student Grant and Aid Programs. “It is pretty common,” said Frank Ballmann, the association’s director of federal relations. Only New York and Texas spend more money on grants for private colleges than California does. As a recipient of four years worth of Cal Grant used at a private university, I want to thank whoever it was who first built this program. I have more than paid back the investment in me from my state taxes over the years. I was able to get into a very competitive university and succeed in the program even though I was underprepared by my high school. It is certainly appropriate to ensure that the grants are only used at accredited, quality schools, but there is simply not room for every high school student at UC or CSU. This program helped me and I think it was a net benefit to the state that I used mine this way. Private university tuition has been rising much faster than inflation. Cutting Cal Grants not only denies this reality but also discourages students from low-income families from applying to the universities best able to help them: private ones. Private universities are free to set whatever admission criteria they like. If there’s a will to make the student body more like the state’s population, a private university can read individual applications. Premier private institutions like Stanford and USC have large endowments. Though the standard federal/state financial need figure is a point of departure, private universities are free to make exceptions, and to favor grants (non-repayable) over loans (repayable) and work-study (exploitative). Admission and financial aid decisions at California’s public universities are by formula. The formulas are buried in federal and state statutes and regulations, as well as in institutional policies and practices. Our obsession with formulas means that low-income are less likely to get in, less likely to receive meaningful financial help, and less likely to go. The students I taught in my city’s poorer high school were just as capable as their counterparts in the richer school, but they were steered away from university. A handful made it to community college. Private universities were out of the question, if you believed the guidance department. It made me livid! My greatest regret in leaving teaching is that I couldn’t sustain the level of energy or the financial debt necessary to remain in the profession long enough to see my students through to college. For many families, applying to a private university would have been as implausible as flying to the moon. Paradoxically, Stanford might have said yes, and could have afforded to offer a full ride. One item to note is the difference in class sizes between private colleges and the UCs and CSUs. (And it’s not the simple ratio of professors to students, as public university profs only teach part-time and do research the rest of the time, so the actual class sizes can be much bigger.) I could envision that a first-generational college student might have more support at a private college that offered small class instruction than being one of 200 or 400 students (the norm for GE courses) in a class held in a lecture hall at a UC or CSU.